Developed from ‘the bedside not the boardroom’- refined by clinicians rooted in practice in each setting to ensure programmes are transferable, effective and sustainable in practice. GSF was originally developed in 2000 as a grass roots initiative to improve primary palliative care from within primary care. Developed by Dr Keri Thomas, a GP with a special interest in Palliative Care, supported by a multidisciplinary reference group of specialists and generalists it was first piloted in Yorkshire in 2001, followed by a national phased programme supported by the NHS, Macmillan and more recently the DH End of Life Care Programme. National spread was enabled through a strategic national cascade plan with the GSF Central Team supporting local facilitators, enabling best implementation of the work, overseeing training and audit plus developing further adaptations and resources. As well as Primary Care GSF now provides training programmes in Care Homes (2004) , Domiciliary Care (2012) , Acute and Community Hospitals(2010), Dementia Care (2012) with new developments including Spiritual Care and Clinical Skills. Since 2010, more training programmes have become distance learning with –e-supported group learning through the GSF Virtual Learning Zone and DVDs. GSF has developed and expanded over the last twelve years to meet the challenge of end of life care, in the light of the NHS End of Life Care Strategy in England and the growing acceptance of its importance within health and social care in our country. 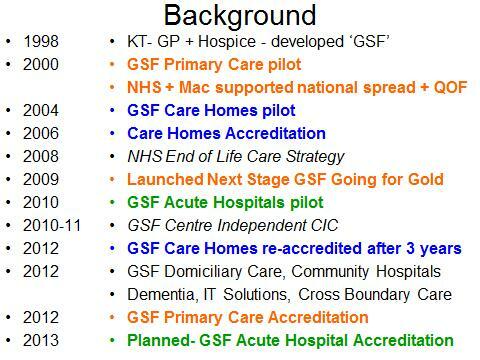 The work is now based at the National GSF Centre in Shropshire, and led by Prof Keri Thomas (National Clinical Lead for the GSF Centre and Hon Professor End of Life Care, University of Birmingham) with a small central team of very committed clinicians plus admin support, Clinical Associates and reference groups.